The Super Eagles of Nigeria played host to Seychelles at the Stephen Keshi Stadium on Friday and the West African side were far from impressive throughout the game. Though they managed to put three goals past the African minnows to claim three points, they were unconvincing. Many Super Eagles supporters expected so much from the Arsenal star prior to the game, but they were disappointed with what they saw from him. Almost all of his first touches were wayward, while his dribbles were unsuccessful. Iwobi had no defense-splitting pass; no shot on target and no meaningful impact on the game throughout the time he spent on the pitch. It was clearly not his day. The Super Eagles often lack coordination whenever John Mikel Obi isn't playing, and that was obvious throughout the game. 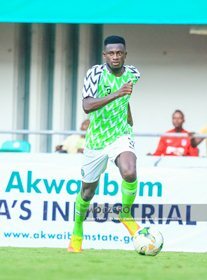 Ndidi, Etebo and Alex Iwobi found it difficult to string many passes together and create clear-cut chances for the attackers to convert. Today's fixture is a confirmation that Mikel Obi is still needed by the Super Eagles heading into the tournament proper. Jamilu Collins showed his pedigree as one of the best crossers of the ball. The Paderborn FC player put a fine cross into the Seychelles' box in the first half of the game but Onyekuru couldn't connect to the ball. Barring an injury or massive loss of form, Collins is definitely going to be in Rohr's team to Egypt in June.